The nutritional value of insects does not differ from the nutritional value of other meat sources such as chicken, beef, pork and fish. In fact protein levels are often higher in insects and crude protein content in many species is above 60%. The chitin exoskeleton comprises only a small part of the total biomass (<10%) and can even be digested. Chitinase has been found in human gastric juices. Recent studies have demonstrated that chitin has even complex and size-dependent effects on innate and adaptive immune responses. The nutritional values of edible insects are highly variable, not least because of the wide variety of species. Even within the same group of edible insect species, values may differ depending on the metamorphic stage of the insect (in particular, for species with a complete metamorphosis – known as holometabolous species – such as ants, bees and beetles), and their habitat and diet. Like most foods, preparation and processing methods (e.g. drying, boiling or frying) applied before consumption will also influence nutritional composition. 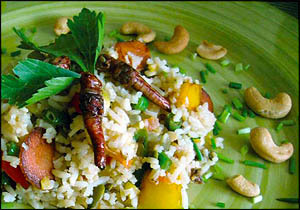 A mixed diet of a staple food and certain insect species enhance protein quality because of supplementation effects.